I really don't know why manufacturers still refer to these as toaster ovens. I don't know anyone who relies on one of these for toasting bread, when the cheapest of toasters tends to do a better job. Broiler oven would seem a better title. This oven is no exception. 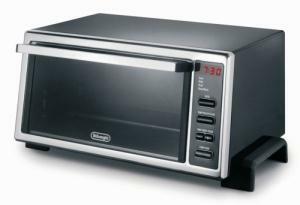 It has 1400 watts of heating power, fully electronic digital controls, and a cool red digital display like your parents' first microwave oven. It comes with the usual settings for baking, broiling and toasting with an automatic shut off. Here's a bonus, though: Being electronic, the timer doesn't tick down like those old mechanical timers. That "ding" still makes me jump. The novel feature to this model has to be the quick-check button. When you press this during cooking, it shows you the current oven temperature. The internal electronic thermostat is rather handy for more than just that. If the oven is already hot when you set the cooking timer, it will adjust the time accordingly. There is a drop down crumb tray for easier cleaning, and the oven comes with a bake and broil pan. Unfortunately, this oven does not feature the rack that slides out with the opening of the door. That makes it a bit more of a challenge to retrieve the items, and allows the door to thunk open onto the counter if not held. Users have reported being less than impressed with the bread toasting function, claiming most settings burn the toast. Hmm. Told you- broiler oven. For better toast, you're much better off with a regular DeLonghi toaster.